Everything The O.C. : Behind the Scenes: O.C. Creator Josh Schwartz's Office Tour! Behind the Scenes: O.C. Creator Josh Schwartz's Office Tour! We present to you the man, the myth, the legend, the one and only creator of The O.C. 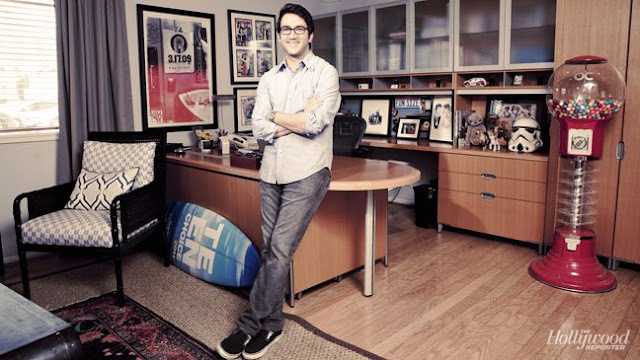 Josh Schwartz and his plush Warner Bros office. As they said in MTV Cribs (Rip) "This is where all the magic happens". Much of the writing and everyday upkeep is done right here. Notice the super sweet O.C. gumball machine which we hear doesn't even require coins to operate! As you may know Josh Schwartz was the youngest TV show creator in history, he was just 26 years old when his idea "The O.C." turned into a huge success (Josh was only 25 when FOX decided to pick the show up). Since then he's been the magic behind many other great shows including Gossip Girl, Chuck and The Heart of Dixie (which featured Rachel Bilson). You may not know this but much of The O.C. was based on Josh Schwatz's time at USC (where he studied film/tv). See that surfboard to the left - it was awarded when Gossip Girl was picked as Best Choice TV Show Drama back in 2011. I bet Sandy could really rip up the waves with that baby! Here is a close up of some of the items kept on Josh's desk. 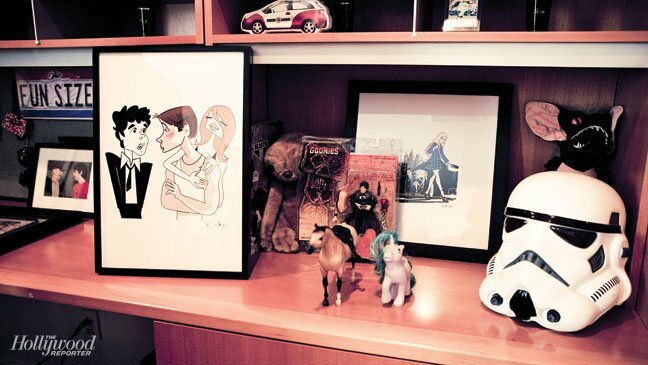 What desk would be complete without Captain Oats and Princess Sparkles (props taken from the show), a hand drawn cartoon of Seth, Ryan and Marissa, a Goonies Data figure, an E.T. plush, a Storm Trooper helmet (a gift from George Lucas himself) and a Gremlins plush. As you can see Josh is a pretty outspoken uber geek and that's what we love about him. We can only assume that the Cohens bagel slicer and Ryan's leather choker is somewhere in those cabinets as well! Labels: Behind the Scenes, Just for Fun, Lovable Props From The O.C.